There are many types of roofing systems available. The most common rubber roof across the US today is EPDM. When EPDM came on the market in the ’60s, it quickly became a favorite roofing system due to its elasticity and the width of the material. 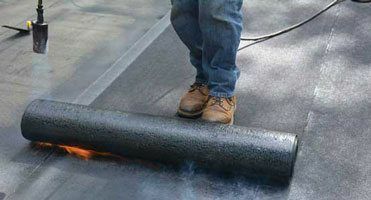 The most durable rubber roofs with little maintenance are the Modified Bitumen Torch Down Roofs. These roofing systems were introduced by the Italians in Europe first in the late ’60s and then quickly spread to the US in the early 70″s. The Torch Down Roofing System started to lose momentum in the late ’90s due to better marketing strategies of the EPDM industry. Watch the Video about the explanation of a Two-Ply Rubber Roof system. The next Video shows where we torch a rubber roof over old and a new contraction roof. 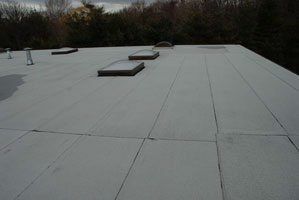 The best rubber roof is to have 2 or 3 rubber membranes fused together on top of each other. Modified Bitumen rubber roofs are the only roofing system where you can melt two layers together. 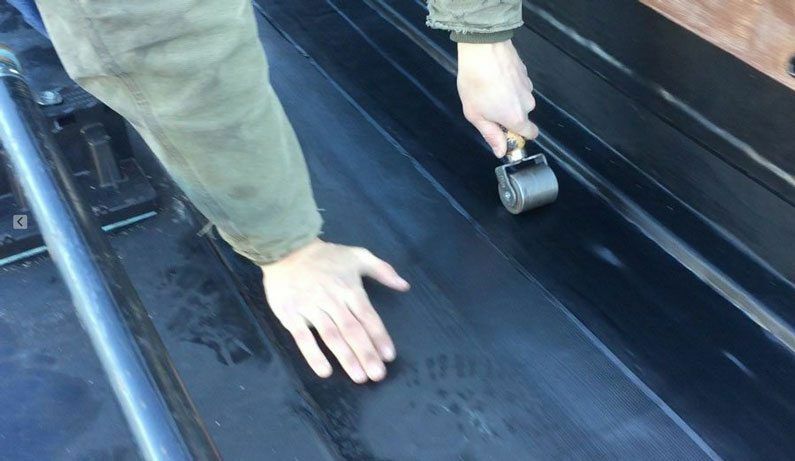 With EPDM Rubber Roofs and TPO vinyl roofs it is not possible, but in the case of TPO roofs, it is feasible to glue the second layer on top of the other. Modified Bitumen Rubber Roofs will last indefinitely by installing two or more layers fusing them together over each other. EPDM Rubber roofs are known to start leaking within a few years of installation. The heat and ultraviolet on the black surface break down the glue that bonds the seams together causing it to leak. In 2015 EPDM manufacturers have introduced yet another solution to the failing adhesives. This fix is not proven, and it is evident that EPDM rubber roofs are not made to last more than fifteen years. Roofing Contractors prefer EPDM Roofing Systems and will promote that instead of Modified Bitumen membranes. EPDM is relatively easier to install with little tools needed. Most roofing contractors only have experience in EPDM Roofing and therefore will promote what they have more knowledge of. Withstands the abuse of air conditioning crews, snow removal,, and cleaning crews. Installation cost – Since you can install MB almost over any surface and re-use existing flashing, it is also the less expensive than the other systems. Installation surface – we have installed MB membrane over any surface that’s out there. Gravel roofs, metal roofs, over TPO and over EPDM roofs. This is not so easy to do with EPDM or TPO. Extreme weather conditions – MB membranes can be repaired in any weather condition. Abuse – Flat roofs get abused all the times. People come to install antennas, repair air conditioning, clean drains, remove snow. With MB membranes, it will withstand the abuse better but in case it gets damaged, it’s easy to repair, unlike the other systems. SBS polymer-modified bitumen membranes This is a cold apply process. The tar is mopped down, and the membrane is rolled out over this liquid tar that will then adhere it together and to the sub roof. APP polymer-modified bitumen membranes This is the Torch or Heat applied Rubber membrane. This is the most flexible and durable system.